The compartmentalisation of individuals into the categories of economic migrants or refugees obscures the fundamental ways in which these two groups are intimately related through remittance economies. 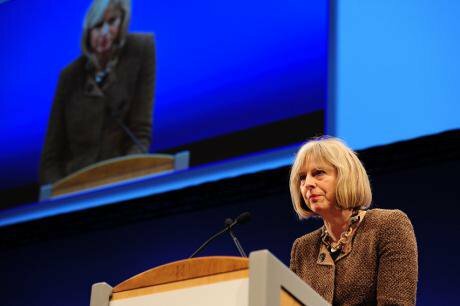 British Home Secretary, Theresa May (Ken Jack/Demotix)With the prevalence of reports in the media documenting the horrendous conditions faced by individuals within Eritrea, and several thousand leaving the country per month, a pertinent question is who remains in the country and why? Conversations with colleagues and friends in Eritrea last year, in the context of wider research in Asmara on Eritrea’s historical relationship with its refugees in Sudan, often turned towards people discussing why they had not left the country and claimed asylum elsewhere. For many, their rationale was simple: because somebody they knew already had. Those that had already left now constituted the “lungs” whose remittances kept those within the country alive. It was not uncommon for individuals to fully attribute their survival to the periodic transfers of money from those “outside”. And what would happen if that flow dried up? All of their dependents – whether brothers, sisters, fathers, mothers, friends and wider relatives – would have to rethink the feasibility of remaining in Eritrea. Many reasoned that the only solution would be to themselves cross the border and leave their country. For many reasons, such an outcome is undesirable. Every stage of the onward journey carries dangers, such as human trafficking through the Sinai Desert, or the precariousness of crossing the Mediterranean in unseaworthy vessels, and no stage contains any certainty of accessing protection or employment. Leaving Eritrea also forfeits individuals’ automatic right to return unless they sign a ‘letter’ of apology at an Eritrean Embassy and pay the 2% income tax required by citizens living abroad, and as such their rights to assets within the country. As UNHCR has cautioned in the past, it potentially places their relatives and friends at risk of being accused by the Government of assisting their escape and being punished through imprisonment, fines or substitute forced conscription. For others, love for their country runs deep and they do not wish to leave it after its hard-fought struggle for Independence which ended in 1991. The hope is that its current challenges are temporary, and that individuals can get by until the economy and employment opportunities recover. Their desire to stay put is nonetheless inseparable from the ability of others around them to move. Many of the those individuals that we stop from entering Europe, barricade in camps in Calais, or ping pong between European Member States on an increasingly frequent basis are therefore part of complex transnational coping strategies that challenge the value of drawing an absolute distinction between the ‘economic migrant’ and the ‘genuine refugee’. This relationship is clearly something that has been missed by the UK Home Secretary, Theresa May. In a speech this week that the right leaning Telegraph described as ‘awful, ugly, misleading, cynical and irresponsible’, she suggested that those who make it to the UK through their own initiative are somehow less deserving candidates for assistance, protection and ultimately refugee status than those who remain closer to their countries of origin. In doing so, she sets up a ‘false choice’: either we can help those individuals who make it to Europe or we can instead concentrate our efforts on the more ‘vulnerable’ individuals effectively waiting their turn in refugee camps in countries of origin. The similarities to Tony Abbott’s discussions of ‘undeserving’ ‘queue jumpers’ and ‘boat people’ in Australia is uncanny. The ex-Australian Prime Minister has always been clear that “If you want to start a new life, you come through the front door, not through the back door”. On the one hand, and as is regularly discussed, penalising individuals for their mobility by suggesting that reaching Europe somehow makes them less deserving of refugee status abrogates our responsibilities under the 1951 Refugee Convention. Young, fit, mobile women and men are similarly victims of war, repression and persecution, especially in situations of forced national conscription and generalised violence. Owning a smartphone does not mean that you do not face persecution. On the other hand, a distraction from understanding the problems faced by individuals in Europe and at its frontiers right now has been our obsession with how to categorise them, purely according to their status in the immediate ‘here and now’. As Professor Roger Zetter continues to argue, the fixation on labelling detracts from the real protection obligations that states have towards individuals. Beyond the fact that why people move is always a mixture of voluntary and involuntary factors, the compartmentalisation of individuals into the categories of migrants or refugees obscures the fundamental ways in which these two groups are intimately related. 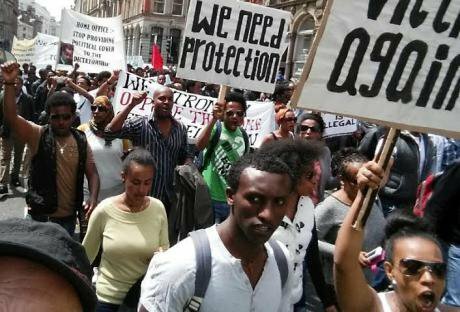 As is so clear in Eritrea, by mitigating against the worst depravities of the state and its market, those individuals who can leave become ‘economic migrants’ precisely to protect their families and friends from becoming refugees. Human mobility is thus at the heart of protection. Eritreans protest in Liverpool, 2015 (Right to Remain)Plans by the EU to reduce the numbers of individuals leaving Eritrea through development aid and trade agreements therefore epitomise the absolute inability for policy-makers to join up the dots between those leaving the country and those staying behind. First – and quite simply – when it is the violence perpetrated by a state which is resulting in their citizens’ choosing to leave, channelling aid through those very same institutions seems to fundamentally miss the point. Second, millions of pounds worth of pledges of development aid (as has been the case in Eritrea) is often nothing compared to the scale of remittances that many states receive through their diaspora, especially when pledges do not necessarily ever materialise. Remittances are not only quantitatively greater, but also qualitatively more effective at assisting local populations and catalysing their development. Whilst evidence therefore abounds about the importance of remittances and the value of facilitating these global flows of money, the celebration of remittance economies seems to have remained detached in the popular media from the broader debates on migration and asylum. Linking these three debates is nonetheless critical. Images of young women or men sat on the fences at Melilla or boarding trains in Europe often invoke the label ‘economic migrant’, as if to dismiss the critical importance of their journeys. Explanations seem to suggest that it is because of these ‘economic migrants’ that the EU is incapable of providing more support to more ‘deserving’ and ‘vulnerable’ individuals elsewhere. On the contrary, and alongside the fact that on too many occasions individuals do not get access to the protective refugee status that we have a responsibility to provide, in certain situations it is entirely because of these ‘migrants’ that other individuals in their networks are not forced to become ‘refugees’. In allowing certain individuals to stay put, they prevent whole families from having to cross militarised borders, board ramshackle boats or pay huge fares to be smuggled in appalling conditions overland. Remittances provide a lifeline, both to individuals who remain within countries that are experiencing high degrees of violence, persecution and state failure, and for individuals who wish to remain in refugee camps near their country of origin. Unlike the false dichotomy established by Theresa May, the two groups are not involved in a zero-sum game whereby the benefits accrued by one group come at the direct cost to another. And neither do entire families necessarily wish to make the treacherous journey to Europe; the risks from war and displacement may be mitigated by one or two members of the family being actively encouraged to pre-emptively travel further afield in search of employment. In denying particular individuals the opportunity to provide financial support to friends and relatives outside of Europe, our policies and approaches therefore put an ‘or’ in the ‘migrant/refugee’ debate. We can either welcome individuals as economic migrants, or deny them this opportunity and welcome more of their friends and relatives as refugees. We should not be forcing individuals – such as the Eritreans discussed above – to go down the latter route because we have denied them access to the former. If we are going to draw a line between ‘economic migrants’ and ‘refugees’ then it should go directly from one to the other, not down the middle.